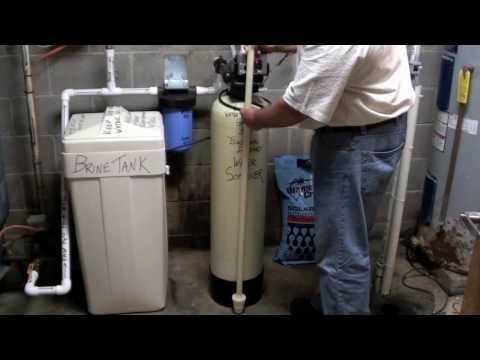 The water softener should be installed and the inlet, outlet and drain connections made in accordance with manufacturer’s recommendations and to meet applicable plumbing codes. 1. Manually index the softener control into the service position and let water flow into the resin tank. When the water flow stops, open a softened water tap until all air is released from the lines, then close the tap. Note: the various regeneration positions may be dialed manually by turning the knob on the front of the control until the indicator shows that the softener is in the desired position. 2. Manually index the control to the backwash position and allow water to flow at the drain for 3 or 4 minutes. 3. Make sure that the salt dosage is set as recommended by the manufacturer. If necessary, set salt in accordance with the setting instruction sheet. Manually index the control to the brine fill position and allow the brine tank to fill to the top of the air check. 4. Manually index the control to the brine draw position and allow the control to draw water from the brine tank until it stops. 5. Plug in the electrical cord and look in the sight hole in the back of the motor to see that it is running. Set the days that regeneration is to occur by sliding tabs on skipper wheel outward to expose trip fingers. Each tab is one day. Finger at red pointer is tonight. Moving clockwise from red pointer, extend or retract fingers to obtain the desired regeneration schedule. 6. Manually advance the control to the beginning of the brine fill position; and allow the control to return to the service position automatically. 7. Fill the brine tank with salt. 8. Replace back cover on the control. 9. Make sure that any by-pass valving is left in the normal service position.